At any time you can click the top right corner icon to jump to your personal profile page. The profile page is split into 3 sections: your Header, Portfolio Tab, and Badge Tab. Your Header is completely customizeable. Click "Edit Profile" to update your avatar image, header background, biography, and personal information. Click save when done to update your profile. Your Portfolio Tab will show on default and be the home to your 3 main collection blocks: Your Collection List, Tradelist, and Wishlist. Here you will be able to see quick stats of each. Click on a specific block to open up your full itemized collection where you can edit order, take notes, and get more detailed with your inventory. Drag-and-Drop to change order. Click the dropdown if you would like to see your decks by "Custom Ordering, Recently Added, or Alphabetical". You also have the option to click the icons next to it to view your collections in "Grid View" or "List View". On the left of your collection will be share buttons if you would like to share them with others on social media. To get back to your profile view simply click your avatar in your bio or in the top right navigation. Your Badges/Actions Tab is under development and currently shows recent action history. The Discover search bar (also available in navigation) is a great way to do a quick direct search on an item that you know already exists. If you've ever stumbled upon something that crossed your eye and wanted to learn more about it, a Discover search would be the best way to pinpoint the deck and pull up the available information on it. The Filter search is more reactive than Discover. Rather than being limited to 1 search term, Filter's biggest capability is managing multiple search terms. This is for when you are not quite sure what you are looking for. By selecting/deselecting each tag you will be widening or shrinking your search results. This site is run on open source help from the community in which anyone can contribute. There are two main ways to contribute. You can either "Add a New Deck" or "Edit/Add" an existing deck entry. If you search and do not find a specific deck you can access "Add a New Deck" in your profile navigation dropdown and upload the appropriate information on the new page. If you see a deck that is missing information you can simply scroll to the bottom right of the deck page and click "Edit/Add" which will bring you to the revision page. There you can update the deck to correctness. SEARCH WELL FIRST. Only add ACTUAL decks that are fully qualified playing card decks (no coins, add ons, general card games, etc). Add ALL related information for ALL the fields, and do so accurately. Only add decks that you actually have in your possession and can provide quality scanned actual images of the decks (no photos, screen grabs, downloads). See details below as needed. * Do NOT add card games that do not also function as a standard deck (has numbered cards, courts, suits, etc). Exceptions can be made for card games that also are a full deck, alternate or additional suits, alternate indices, using numbers instead of JKQ, or of course alternate conventions worldwide, etc. For example, do not add Uno, Hanabi or Cards Against Humanity , but a card game like Wizard would work because it can also easily be identified as a standard deck for use in other standard card games. * Tarot decks fall into a grey area and can be added to Portfolio 52. Please use the 'Tarot' option under card size when adding and possibly in the name as well. * Do NOT add coins, shirts or any other add on from a card related Kickstarter project or theme. This includes custom wood boxes UNLESS it serves as the ONLY tuckbox (as a full tuck swap) and was fully packaged and sold as a set vs an add-on. * If you don't have a quality scanner, at least use the Google PhotoScan app for your phone (see other learning entry for details). If you don't want to take the time to use a properly captured and rotated/cropped image, please do not add the deck, especially if it is a new modern deck. In the current version of Portfolio52 only editors can modify images which means by adding an incomplete deck the vast majority of users can not correct it and are locked from adding their own better version. * First be certain the deck isn't already added - both search and also check under ALL of the possible categories/producers/brands listings (to account for misspellings). NOTE - Do NOT add a new brand unless there are at least 5 decks to be listed under that new grand, otherwise use the Unknown, Kickstarter Misc, Casino Misc or other appropriate catch all groupings. * Seal swaps, those decks that have a limited edition primarily due to a custom and usually serial numbered sticker/seal can also be added as separate entries. However, all decks within that seal are listed together (if it was a small run of 5, do not list each individual deck as separate entries). * SUBTITLES: If applicable, include any other subtitles to help specify and differentiate it from other similar ones in the series. Consider listing the Version (recommend using v1, v2), Color, Limited Edition (if so called out by name), Date, etc as needed While the order is not critical, only list items essential and provided by the producer. If possible list from general to specific (version usually first) and be consistent with other decks in the series and by the same producer if possible. * BRAND: If the deck is branded (as Bicycle for example) then list it as such in brackets "", otherwise do not use. Note this is not often required on an uncut sheet as typically only the tuckbox is branded. * CLARIFICATIONS: ONLY if it is critical for differentiation or in searches, place within parenthesis "()" any other common clarification or alternate names not listed on the deck or by the producer. For example, Pandamonium also goes by Panda or to designate 'misprint', 'Limited Edition' (if not part of the deck title - for example if implied only by special color or seal) or any other common difference. * Only use these name components if essential and especially note that DATE should only be used if it was produced multiple years and need to distinguish printed year. Tip - The text input box for the description is resizable to make it easier to work with, click/drag the bottom right corner to resize. * While not essential, adding a description can be valuable to collectors, especially in the future as details of the deck are forgotten. * Anything relevant about the deck, illustrator, manufacturer, stock, crowd funding details, URLs, etc can and should be included. This is a great place to document information about the deck for which there are not yet any custom fields for it. Funded as a Kickstarter project on with pledged from backers, this was a <single/multiple/etc deck set>. Designed by through , this deck features the theme of . . This P52 Entry is for the . Funded as a Kickstarter project on April 10, 2014 with $116,525 pledged from 1,394 backers, this was a set of two decks (Continental & The Crown) in three variations (Standard, Limited, Display) for a total of 6 decks. Designed by Jackson Robinson through Kings Wild Project, this deck features the theme of the United States struggle for independence against Britan. This PCDB Entry is for the Continental Display Deck which was the same cards as the Limited version, but with a plain style tuck case so collectors could feel free to use this deck and keep the actual Limited deck safe. * To minimize future confusion, the primary source is the copyright year printed on the deck if it exists. If that was a copyright date prior to actual production then use the description field to explain the reason a different date as selected (may happen for KickStarter decks where artwork and copyright details created prior to actual production year). If a date is not on the box then using any other source information available on when it actually was printed is the next best option. * For a crowd funded deck (eg. Kickstarter), the date/year used should be when the deck was confirmed as printed, even if some backers have not yet received their rewards. * If the exact year is not known, select the best guess and clearly list in the description the source and any doubt, or use the default 'Unkown' selection. * Replica/Facsimile decks used to be able to list BOTH the date when the copy was printed AND the date of the deck it is a copy of. Since this can no longer be done, list the year as the year the replica was printed and the original deck year can be listed in parenthesis in the title and/or description. * NOTICE - There is currently a bug that results in logging out General and Contributor users if an image over 2mb is uploaded. If you have this issue check your image size and reduce first. * Personally scanned good quality (semi-high DPI) images are preferred, avoid early production (Kickstarter) images if possible since early renders often change before the final printing. Exception can be made to utilize renders for uncuts due to difficulty scanning or capturing a quality squared photo. * Stock photos from the producer are usually acceptable, but when using those found on the internet do NOT use any copyrighted images. Sparkz on UC is a member and has added his photos and they use Creative Commons ([url]http://www.sparkzcollector.com/#!image-usage/c22j7[/url]) so those will be seen on the site with watermarks, but don't assume any image on the Internet is free to use. Again, personally scanned or photographed are best when possible and when using images that have clearance for non-commercial use read the details and do NOT remove any watermarks. * Using Photographs instead of scanned image - Use the Google PhotoScan app (see other Learning entry for details) if this is your only option due to lack of scanner or available images, it's also often the best option for uncuts. If that is not an option, please wait and allow others to add the deck instead, unless it's a VERY rare or unusual deck and stock images are not available. * Replacing the SAME image with a better version is always encouraged. * When selecting what image to be the thumb for a deck, when possible choose the image of just the tuckbox face. * When selecting what image to be the thumb for an uncut, when possible choose a straight on view of the full uncut sheet without any mat/frame (camera photo or early proof images work best as source). * The application will resize to apx tuckbox face dimensions within grouped views, but will display proper dimensions when viewed inside an entry or directly. *Company - This is the company that produced the deck, aka producer, the person(s) or company(s) that had the vision and saw the idea complete to creation. In many cases this is NOT the printer. Card Stock - Select the card stock used by the printer, usually will be a trademark name or generic descriptor. Court Card Customization - Select Standard, Modified or Custom based on the design of the court cards. Colors - Optionally list the primary colors used in the deck artwork. Themes - Optionally select any primary themes used in the deck artwork. Release Year - The actual year the deck was produced if known, see special section above. Artist - Person(s) that created the actual artwork if known. Finish - Select the finish used on the cards by the printer, usually will be a trademark name or generic descriptor. Box Features - Select any box features like embossed, foil, etc. Additional Tags - Optionally add any other relevant tags about the deck to help with searching, although the description field could also be used. *[TUCK IMAGES] - Not an actual field, but these are required and please see special 'IMAGES GUIDELINES' section above. [GALLERY] - Not an actual field, but it's important to note there are different kinds of images that can be added and identified, please consider adding some images beyond just the tuck images. NOTE - The 'Brand' field (eg. Bicycle, Tally Ho, Bee, etc) was removed in an earlier update and it's not determined if it will make a return. Instead, use the provided naming convetion to designate any brand which can also then be searched on. * If you don't have edit access, you can post your duplicate find in this thread with the links to the 2 decks in question to allow for any discussion as they may have differences and not actually be duplicates. This also lets people be aware of a future merge/deletion. * On occasion, and after sufficient time as passed for people to be made aware of the pending deletions, these marked duplicates/deletes will be fully removed. The Discover Feed is a great way to simply browse for inspiration. Jump to the Discover tab and browse countless decks from various countries, companies, and dates. The Discover Feed can also be customized based on your browsing preferences. Click the dropdown to reveal 4 different options: Random, Newest, Oldest, and Alphabetical. "Newest" and "Oldest" refer not to actual production dates but to additions to the database. If looking for a specific date, using the search bar is best. The two icons next to the dropdown are "grid view" and "list view" which you can toggle between depending on if you prefer visual graphics or textual information in your browsing. Besides filtering, reviews are the newest feature to appear on version 2.0. Now you can share your reviews on a specific deck. To do so, simply click the deck to access the full page info and click the "Reviews" tab on the right. Here you can write a review and see the reviews of others. You can leave a rating and even include your own video review if you have one. Note that YOU SHOULD OWN THE VIDEO before adding the review. Spam will not be tolerated. The most helpful reviews will be the ones that garner the most respect. If you see a review that you think is helpful you can upvote the review. This encourages honest and fair reviews overall. When clicking on any deck while browsing you will be accessing the "Quick-View" Box. Here you will be able to see core information at a moments notice. This includes the deck name, year, description, image close ups, as well as personalized information that you can edit within the box right then and there including adding a deck to one of your lists and adding personal notes. If you have a specific filter in place and want to view all the decks you can click left or right of the "Quick-View" Box to view the previous and next deck information as well. Click "Full Page Info" to be brought to the Deck Page to see more information specification and galleries. For frequently asked questions click "FAQ" in the footer. For all other questions, feedback, and bug submissions, contact us directly at info@portfolio52.com or click the mail icon in the footer. The best method is STILL to use a flat bed scanner to a PC and then properly crop the deck image. This results in the best image quality most of the time. Scanners can also be found fairly cheap used, especially if you buy an old printer with one built in (even if you never use the printer). However, to address those without access to this equipment and your only option is a phone, there is a way to do this properly using the 'PhotoScan' mobile app from Google. This automatically will do some color corrections and crop the photo, but most critically will adjust the skew angles which is the largest problem with using a phone. It's near impossible to position the phone on exactly the same plane as the deck and this results in <>90 degree corners. There's also the potential issues with focus and lighting, but those we can address as well. Step 1 - Get the PhotoScan app, it's available for either iPhone or of course Android. Step 2 - Use a contrasting and ideally uniform background to place the deck on (if you have a brown deck, don't put on a brown table). In most cases it's simplest to just put the deck on a sheet of white paper (or colored paper if a white deck). Step 5 - If you will eventually remove the cellophane from the deck, do that first as it can cause reflections. If you don't open your decks, that's fine just be especially careful of reflections. Step 6 - Use the PhotoScan app to 'scan' the deck. It will walk you through the process, but basically you take an image and then it has you take 4 more in each of the 4 quadrants of the image. You may then optionally adjust the corners/edges. Be sure to place the phone on roughly the same plane as the deck by holding it directly above the deck. While the app will automatically correct for this, it's not totally perfect and extreme angles will miss edge details otherwise. Obviously if doing so results in shadows or glares then adjust position and let the app correct the skew more. KEEP YOUR HANDS STEADY, don't go too fast. Step 7 - Save the image to your phone, more important if using iPhone, so that you can then use it to upload to the site. 4) Cropped image from producer/artist/KickStarter (for 'copyright' reasons try to avoid using images from re-seller shops or blogs). Often times this is the only real solution for uncuts, other than this new PhotoScan option. A. It's best to first see if there is an existing thread and if not create a new one within this 'Support Requests / Bug Reports' sub forum on UnitedCardists. To retain the quality of decks submitted to the database, and especially to control for any ad network bots spamming the site, decks submitted are not immediately approved. Only those users who are Contributors can review and approve them. Under the small triangle menu on the top right of the website an entry for 'Unapproved Decks', the direct URL for this is https://www.portfolio52.com/deck/add. For users who are Contributors, they will be able to use this page to see all submitted decks that have not yet been approved and then use the links to those submissions to review and ultimately approve or save and then edit for needed updates or to mark for deletion. Once the submitted deck entry is clicked on and loaded, the first thing the Contributor should do is see if they are qualified to review it. Most users can handle most decks, but if you are not certain you can confirm if it is accurate or a duplicate vs slight valid variation you can leave it for another to handle. If you intend to go forward then click the 'Add/Edit' link of the bottom right. This will then bring up the deck in edit mode, but due to a bug any changes made at this time will be lost. Instead first simply click the 'Save' button on the bottom left to add it as is for now (you may be prompted to complete missing required fields - just enter whatever since it will be lost due to bug at this step). Once saved/added you can again click the 'Add/Edit' link on the bottom right to start the review process. Make sure the submission is complete and is a valid deck and not a duplicate of a deck already in the system. You can use the Guidelines in the Learning area, see 'Adding/Editing Decks' section. In particular be sure the images are quality and all information is complete and accurate. Use search engines as needed to search and update. If the image provided is not quality you may be able to download it, crop and re-upload, or find a non-copyright image on the web to use instead. Once the edits are done and you want to keep the image you can simply save the changes. Alternatively you may also reject the submission if there are too many issues that you can not correct. 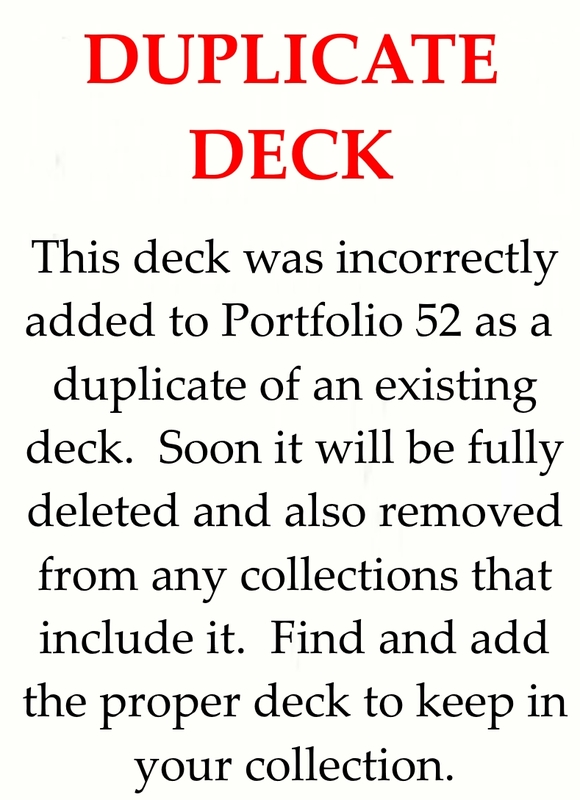 In the case of a rejected or duplicate deck you will not be able to directly delete. Instead, follow the process within the 'DELETING/MERGING EXISTING DECK(S)' entry within the '' [url=https://www.portfolio52.com/learn_posts]following the guidelines (see 'Adding/Editing Decks' section)[/url]. Basically you will rename the deck as to be deleted and update the image for the benefit of those who have it in their collection for attention, plus it's a good idea to list in the description what it was a duplicate of (use URL) and name since the new name will be TO BE DELETED. An admin will occasionally clean up these marked for deletion decks.